Postać - Trooper. Punkty: 15/20. Wytrzymałość: 12. 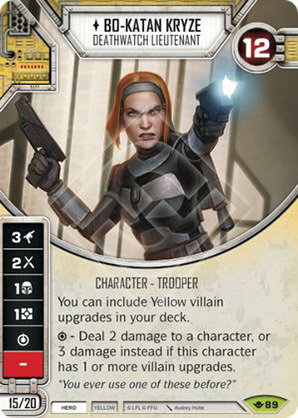 You can include Yellow villain upgrades in your deck. - Deal 2 damage to a character, or 3 damage instead if this character has 1 or more villain upgrades. "You ever use one of these before?" Way of the Force #89.